Montreal, July 19, 2009, Air Canada provided the following comment on Wednesday in response to receiving confirmation from the IAMAW that its members have ratified their tentative agreements on labor stability and pension funding relief. This successfully concludes the ratification process by all five of Air Canada's Canadian based unions. 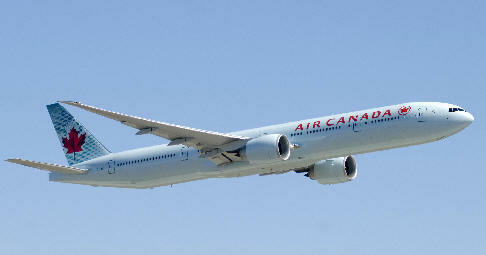 Air Canada is Canada's largest airline and flag carrier. The airline, founded in 1936, provides scheduled and charter air transportation for passengers and cargo to 96 destinations worldwide. Its largest hub is Toronto Pearson International Airport in Ontario. Its main base is Montreal-Pierre Elliott Trudeau International Airport in Quebec. Air Canada is the world's 9th largest passenger airline by fleet size and the airline is a founding member of Star Alliance, an alliance of 21 member airlines formed in 1997. Air Canada's corporate headquarters are located in the Saint-Laurent area of Montreal, Quebec. The airline's parent company is the publicly traded firm ACE Aviation Holdings. "The successful conclusion of the ratification process represents an important milestone in achieving the stability required to manage through this difficult economic period," said Calin Rovinescu, President and CEO of Air Canada. "It is an encouraging sign of our employees' support for working together to build a stronger business in the current economic context. I commend the union leadership and Air Canada management teams involved in the process for their hard work and professionalism, and extend a special appreciation to the Honorable James Farley Q.C. for his contribution. "These are extremely challenging times for both the airline industry and credit markets and there remain many hurdles to overcome, including the necessary governmental approvals for the pension funding arrangement and securing new financing to meet our immediate liquidity requirements. If that is achieved, to return Air Canada to profitability will require a fundamental restructuring of our business. This will include the execution of a disciplined and significant cost reduction program requiring participation by certain suppliers and stakeholders, as well as new revenue generation initiatives. At the same time we will remain focused on re-engaging our customers and ensuring that we do not concede market share to our competitors without looking for value added ways to preserve it," concluded Mr. Rovinescu. The Company has concluded comprehensive labor agreements on a cost neutral basis for 21 months with its entire unionized workforce in Canada, in addition to a pension funding moratorium. The terms of the labor contract extension agreement specify that there shall be no changes to wage rates and pension benefit levels during the extension period. The agreements remain subject to the adoption by the Federal Government of an Order-in-Council amending Air Canada's pension funding rules and Air Canada raising a minimum of $600 million in new financing. The pension funding agreements are also subject to the support of the company's non-unionized employees and retirees. A consultation process with these groups is currently under way and is expected to be concluded by July 18, 2009. The five unions representing Air Canada's Canadian-based employees are: the IAMAW representing approximately 12,300 Technical, Maintenance and Operational Support, Clerical and Finance Employees, ACPA representing approximately 3,200 pilots, CUPE representing approximately 6,700 flight attendants, CAW Local 2002 representing approximately 4,100 Customer Service and Sales agents and CALDA representing approximately 70 flight dispatchers.